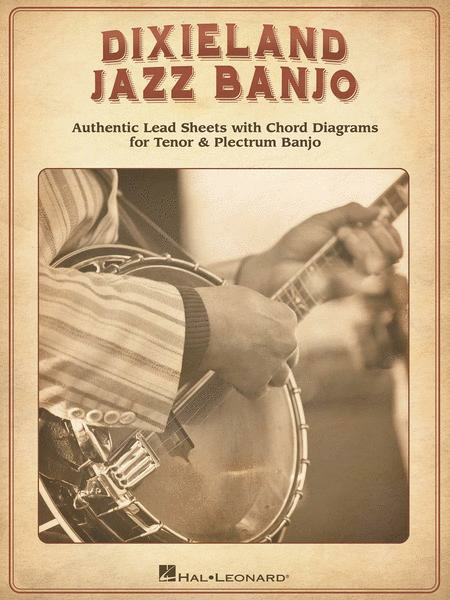 Authentic Lead Sheets With Chord Diagrams for Tenor & Plectrum Banjo. Composed by Various. Banjo. Dixieland, Jazz. Softcover. 120 pages. Published by Hal Leonard (HL.123217). Tenor and plectrum banjos are key ingredients of Dixieland jazz music. The bright percussive chord strums and flashy tremolo picking glissandos help define the genre. In the 1920s, when Dixieland jazz was at its zenith, the four-string banjo was the fretted instrument of choice because it could easily be heard above the simultaneous improv of the band's clarinet, cornet, saxophone, and trombone frontline. (Electric guitars were not invented until a decade later.) The chord voicings in these expertly crafted arrangements were selected so that the melody notes were always within reach to enable the user to play chord/melody style if desired. The lead sheets consist of lyrics and two sets of chord diagrams – tenor and plectrum – positioned throughout the arrangements. This collection of 45 songs includes: Ain't Misbehavin' • Alexander's Ragtime Band • Basin Street Blues • Bill Bailey, Won't You Please Come Home • Honeysuckle Rose • I Got Rhythm • Lazy River • St. Louis Blues • Sweet Georgia Brown • 'Way down Yonder in New Orleans • and more.